A forerunner in motorcycle heritage preservation. For thirty years, brothers Jean and Francois Gagnon have shared a passion for motorcycles, acquiring an impressive collection along the way. In 2003 they realized their dream of opening a motorcycle museum, the acclaimed L’Épopée de la Moto. 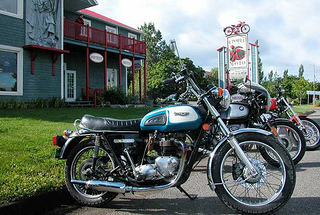 Located in Saint-Jean-Port-Joli along the cliff-side banks of the St. Lawrence River, the museum has seen more than 30, 000 motorcycle enthusiasts walk through its doors in the past 9 years. It boasts a collection of 100 bikes dating back to a 1903 Clément 150 and a number of unique thematic displays. As the first motorcycle museum in Québec, L’Épopée de la Moto will be honoured as a forerunner in motorcycle heritage preservation.